God was revealed to each one through spiritually dynamic sessions with Pastor Gustavo, Pastor Juan and our local pastor, Alex. They arrived quiet and shy, barely smiling, many never having been to the Tiu Rancho Center before. Three days later they left laughing, sharing hugs and email addresses and asking when the next of the four courses would be. Please pray for these young people, that each one will know how and when and where to share God’s love with those around them. None of us can believe that it is now one month later and they have already gone home. We have laughed and cried, remembering all the special moments and realizing how much we miss them already. We would all like to thank Margie and Monica for sharing their talents, their knowledge, and themselves with us. It is the end of the school year for the Bolivian schools and for the education programs at the Tiu Rancho Center. 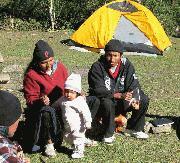 The children will begin their summer vacation, since this is summer time in Bolivia, at the end of November. Their classes will begin again in February. I hope you enjoy seeing the photos. The Tiu Rancho staff celebrated Senior Citizens Day on August 26 with 56 elderly from the Tiu Rancho community. Alex was the host and did an excellent job. I couldn’t understand a word spoken since everything was in Quechua but I could see on their faces how much they enjoyed themselves. We ended the afternoon eating plates of food that were large enough to serve a lumber jack. The staff had been so careful in choosing the food since many of the older folks have no teeth and have sensitive stomachs. As they were leaving they expressed their gratitude for the afternoon by smiling and fervently shaking my right hand and touching my left shoulder. God blessed us all through these moments together. 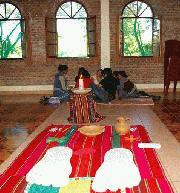 Sewhuicas is located five hours from Tiu Rancho in a semi-tropical area. It is winter here but we still weren’t prepared for ice on the tents in the mornings. However, not one person complained. In fact, many remarked on their evaluations that Sewhincas is the most beautiful place they’ve been to. We cooked together, walked the river, played with the children, chatted around the fire and had many moments of precious time with God. We took time for praise and thanksgiving. In addition we were challenged by God’s call to discipleship. I am including pictures of classes who are using this curriculum in one of our newest churches, Piedra Viva, The Living Rock Methodist Church. This church began three years ago as an outreach of the El Salvador Church by two of its members, Hilda and Jaime Cabrera. They began to respond to people coming to their door to ask for assistance and over time began the Piedra Viva Methodist Church. This morning there were 20 people in the church service and 30 children in Sunday School. This same couple has always told me that the Methodist church in Bolivia has had a difficult time finding appropriate and culturally sensitive curriculum for the children in their churches. The morning I took pictures of the kids, I asked Hilda if she was using the most recent Sunday School material that the teachers had written; she nodded and giggled like a young girl. Two of their young teachers, Ronal and Indira, took part in writing the Sunday School curriculum last January at our workshop at Thiu Rancho. There were eight others baptized this same day from six of the other Methodist churches in the city. 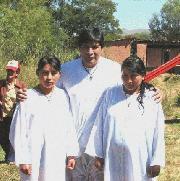 Two weeks later Miriam and Limber chose to have Edson baptized. What a testimony these two women are in their community and at the Tiu Rancho Center where they minister to so many children every day.